The majority of the time at today’s meeting was spent discussing the list of ideas previously submitted for this upcoming year’s plan, soliciting new topic ideas and hearing the priorities of the people present. The topics most discussed were: 1. Increasing housing for no-income, very low income and low income populations; 2. Homeless prevention at the neighborhood level: Preserving housing; addressing Tracktown tourist housing & more; 3. Addressing sanitation issues relative to unhoused neighbors; 4. Neighborhood Day Centers with laundry and other services. We briefly discussed possible changes to the original mission statement from Feb. 2018. There was broad support for the new proposed mission with a couple of changes. PLAN for April 25th meeting: Discussion of sanitation. Outreach to City Parks and Recreation, Public Health Dept and Whiteaker leaders for their participation. Proposed new mission statement – Does this work? 1. Identify resources and offer educational programming related to housing/homelessness with the goal of assisting neighborhood associations in addressing these issues. 2. Hold monthly meetings to facilitate the discussion of housing issues, solutions for ending homelessness and short-term actions, such as increasing sanitation options & the siting of emergency shelter, in order to improve the quality of neighborhoods. 3. Liaise with other community groups working on similar issues believing that collaboration increases the likelihood for positive change. In February 2018, the NLC Housing & Homelessness Committee was formed to (1) identify and discuss current and future issues facing Neighborhoods related to homelessness, and (2) support the acquisition and siting of shelter, sanitation and other supports for unhoused residents. The Committee is developing their 2019-2020 work plan and would like your feedback on focused meeting topics for the group. We have identified a few areas of interest and will ask you to rate them on a scale from 1 (no interest) to 5 (high interest). 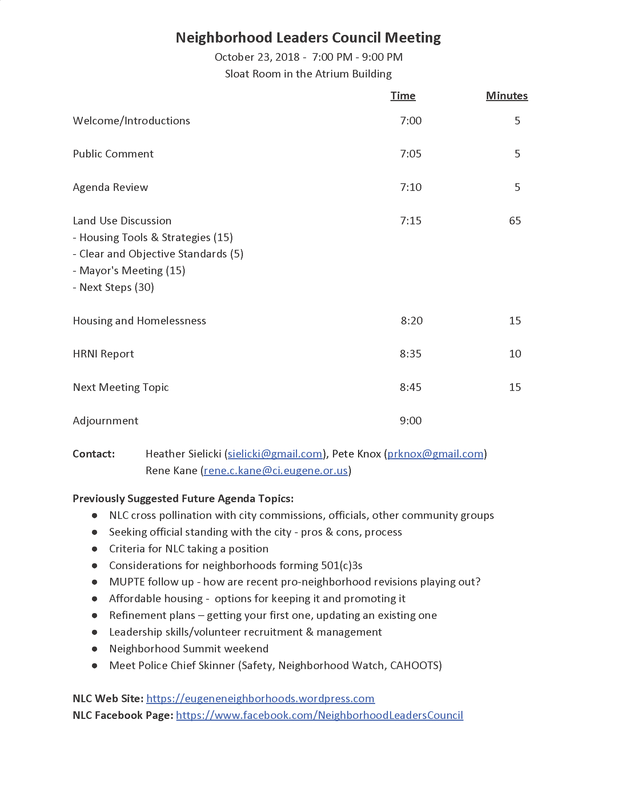 The results to help inform the agenda for our monthly meetings at 12pm on the fourth Thursday of each month at the McNail-Riley house. Addressing sanitation issues for unhoused neighbors. Storage for the belongings of persons without housing (and what to do with what is left behind). Working with the Faith Community to create more shelter and housing. Homelessness prevention at the neighborhood level. Neighborhood safe spots for legal car camping. Using RLID to find vacant land for rest stops. According to the 2018 Annual Homeless Assessment Report, 15,000 people in Lane County experienced homelessness at least once last year due to inadequate housing, income and supports. Providing services is the most cost-effective, compassionate approach to help people get back on their feet and prevent people from living on the streets. Recently, both the City of Eugene and Lane County legislators voted to fund programs to address the social service, housing and mental health needs of our most vulnerable populations. To implement them, our community will need to find appropriate locations for shelter, sanitation and other supports. Neighborhood associations can play a key role by educating neighbors about homelessness in the community and dispelling myths; locating appropriate sites for RV parking, tiny-house villages, affordable housing, and group homes; and connecting stakeholders with opportunities to help in their own backyard. NLC Housing and Homelessness Subcommittee members are available to speak at neighborhood meetings about what you can do to be part of the community-wide response and show the following short video of one of the temporary, transitional shelter programs available to your neighborhood. Please email Heather (sielicki@gmail.com) or Anne (annemillhollen@gmail.com) to request a presentation at your next meeting. The January 28, 2019 work session is an opportunity to provide an update to the Planning Commission on the Housing Tools and Strategies project. No action is requested. We all agree that housing affordability and availability are growing problems in our community. The City’s neighborhood associations are committed to helping address these issues; those who are struggling to pay their rent or mortgage or to even find a place within their budget are our neighbors and we want to find ways to assist them. We were initially hopeful that the Housing Tools and Strategies working group would have a robust deliberative process that would result in well researched recommendations to you. Unfortunately, we feel there was insufficient time and little or no analysis done for the participants to adequately discuss and assess the pros and cons of the options presented. Given this, by a unanimous vote of the NLC members we are asking that the Council not move forward on any recommendations from the HT&S Working Group before adequate analysis has been done to assess the benefits and potential negative impacts of each recommendation. NLC hopes that Council will utilize the efforts of the working group to identify all options and strategies that could most benefit from more in-depth analysis and direct the City Manager to establish new working groups to do this work. We stand ready, as individuals and neighborhood leaders, to work with you to determine what we can do to lessen this financial burden for all our neighbors. The City Council has scheduled a work session to possibly take action of the Housing Tools and Strategies Work group recommendations on Dec 10. Since will not be meeting until late January the NLC agreed to have a special meeting on December 11 the day after council talks about Housing Tools and Strategies in a work session in order to respond in a timely manner. Rene has secured the Saul Room on the 3rd floor of the Atrium from 6:00-8:30. The first half hour will be a cookie social, so bring your favorite cookies. Strategic Economics Presentation – This work is preliminary and subject to change. Votes by Option Number Opens a New Window. City staff presented and Council discussed proposed language on vacant properties, nuisance odors related to marijuana cultivation, and nuisances related to hoarding on Wednesday’s (11/28) City Council work session. Here’s a link to the AIS (Agenda Item Summary) prepared by Code Compliance staff. As part of the Envision Eugene urban growth boundary (UGB) process, in 2015, City Council provided direction on housing by initiating several projects. These included establishing a baseline UGB, establishing urban reserves, growth monitoring and updating the City’s needed housing (clear and objective) regulations. A map was designed to allow the public to visualize the impact of the clear and objective criteria on the residential areas identified as undeveloped or partially vacant during the 2012-2032 Buildable Lands Inventory. The fourth, final meeting to generate and evaluate preferred concepts to improve the Clear & Objective Housing Approval Criteria will be held on Tuesday, October 23, 2018, 5:30-8:30 PM in the Atrium Building Lobby, 99 W. 10th Avenue, Eugene, OR. If you haven’t yet, please send an RSVP to Julie@cogitopartners.com. For additional information on the Clear and Objective Housing Approval Criteria Update, please visit https://www.eugene-or.gov/3947/Clear-Objective.